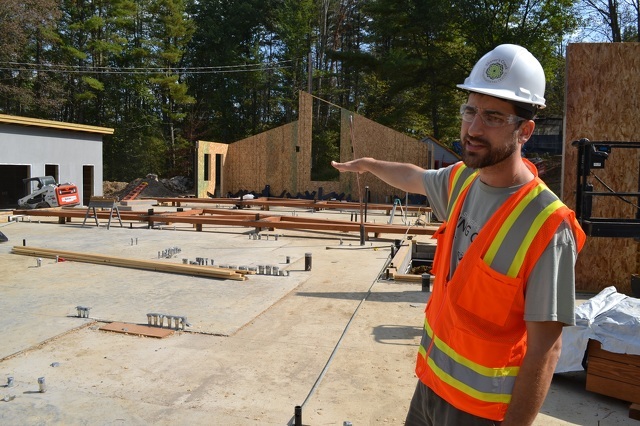 (SEAN YODER/The Gazette) Josh Potter shows off the new add-on section to the main building at Shaver's Creek Environmental Education Center. Just behind him out of frame is the original building, constructed in 1938. Potter is the center's educational operations manager. PETERSBURG — Oh, to be in elementary school again. Those young enough to have gone to Shaver’s Creek Environmental Learning Center while still in grade school may want to make a plan to return once construction wraps up. If you’ve never been to Shaver’s Creek, you can’t go this year. The entire facility is closed until the construction phase wraps up. Right now, the area around the main building is a full-blown work zone with heavy equipment moving dirt and materials and construction workers in hard hats and vests from J.C. Orr & Son of Altoona. Construction got off to a bit of later start than administrators wanted, said Josh Potter, educational operations manager. Some permitting issues kept the project on hold for a few months, but he said they’re looking forward now to the amenities and improved space the project will bring. The main building will see a huge add-on section for the welcoming center, bookstore, staff offices and facilities, accessible restrooms for the public and a new ADA entrance. The original building was constructed in 1938 as a three-season lodge used mostly by Penn State forestry students. By the early 1970s, the building fell into disuse until it became a functioning education field lab in 1976. It now provides an array of environmental learning programs and a recreation site for families, schools, corporate groups and Penn State students. There are two new structures separate from the main building renovations and add-on. Visitors will be able to enjoy a new classroom with wraparound deck that is elevated into the woods off of a slope, putting people right into the trees. This will connect with an already-existing pavilion built eight years ago with a grant from the Department of Conservation and Natural Resources. Potter said this will give Shaver’s Creek much-needed indoor classroom space that was lacking before. The new structure will hold about 100 people, with options for partitions between them. The new maintenance building has already been erected and will provide a space for equipment like tractors and lawn mowers. Potter said most construction is slated to end in January and cleanup to continue through the spring of 2018. Much of the new construction will be sheathed in hemlock harvested and milled right at the site. Architects also blended other native materials into the site such as black locust and ash decking and indoor trim. Potter said they lost the ash trees anyway due to the emerald ash borer. The walls and roofs will also have unbroken insulation for better heating and cooling and will be paid for through a grant from the West Penn Power Sustainable Energy Fund. The $35,000 grant, which will reimburse Shaver’s Creek once construction is done, will give the facility 11 points toward a desired LEED rating, or Leader in Energy and Environmental Design. The grant will also help pay for new variant refrigerant flow HVAC systems that will be more efficient.